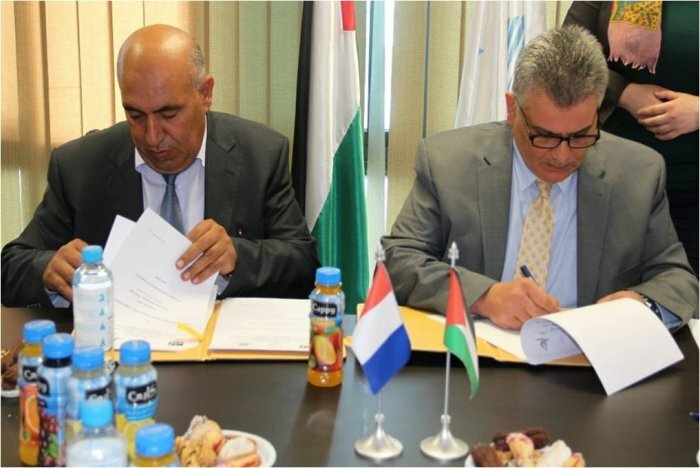 Arab Brothers has signed a new contract for the Construction of Tubas, Aqqaba, and Tayasir Water supply Project, The Agreement was signed in the Palestinian Water Authority headquarter in Ramallah in an official ceremony. The Palestinian Minster His Excellency Mr. Mazen Ghoneim has signed this agreement on behalf of Palestinian Authority, whereas, Ahmad Naser, the Chief of Board had signed on behalf of Arab Brothers. The Signing ceremony included as well, Mr. KarimYaqoubi on behalf of AfD, Mr. Sadi Ali, PMU Director, Mr. Essa Dababat, JSC representative, Head of Municipality, and the CMC Director Dr. Rami Abdel Hadi. This new €3.0 Million project, consists of constructing over 50 km of pipe networks, installation of 5400 prepaid water meters, construction of new pumping station, upgrading the management and billing system of the JSC by upgrading the previous software, providing IT Equipment, and billing systems. This project aims to improve water supply service these communities by improving the quantity and quality of water supplied to the population, and reduce losses resulting from the old deteriorated water networks. Arab Brothers © 1998 - 2019 ,All Rights Reserved.